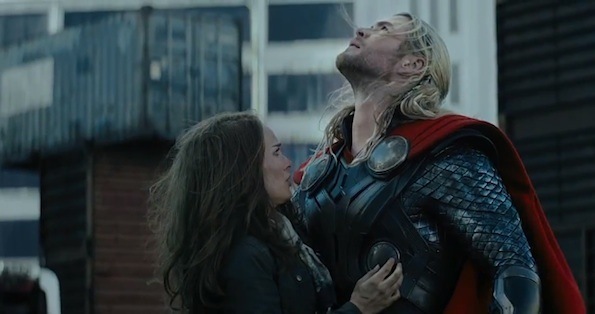 The new trailer for the wonderfully over-the-top Thor sequel is here! Watch Chris Hemsworth screech as his lady love (Natalie Portman, in her first role since 2011’s Thor, after a pregnancy hiatus) is captured. In Thor: The Dark World, in theaters November 8, the red-caped, hammer-wielding hunk of smoldering blond charm must team up with his evil adopted brother Loki to defeat the Dark Elves of Svartalfheim. In the aftermath of Marvel’s “Thor” and “Marvel’s The Avengers,” Thor fights to restore order across the cosmos…but an ancient race led by the vengeful Malekith returns to plunge the universe back into darkness. Tom Hiddleston, Anthony Hopkins, Kat Dennings, Idris Elba, Jaimie Alexander, Rene Russo and Stellan Skarsgård join new cast additions Zachary Levi and Christopher Eccleston (as Malekith). Click HERE for a poster, HERE for set photos & HERE for Hemsworth’s thoughts on director Alan Taylor. Is it just me or should they have gotten the rock to play this part? Thor has to Norwegian-looking, and The Rock isn’t quite pale enough. Maybe you could lobby for the job of spray painting him or scrubbing his skin like they did to Nikki Reed in Twilight?